Do we have to strike a pose every time we land? 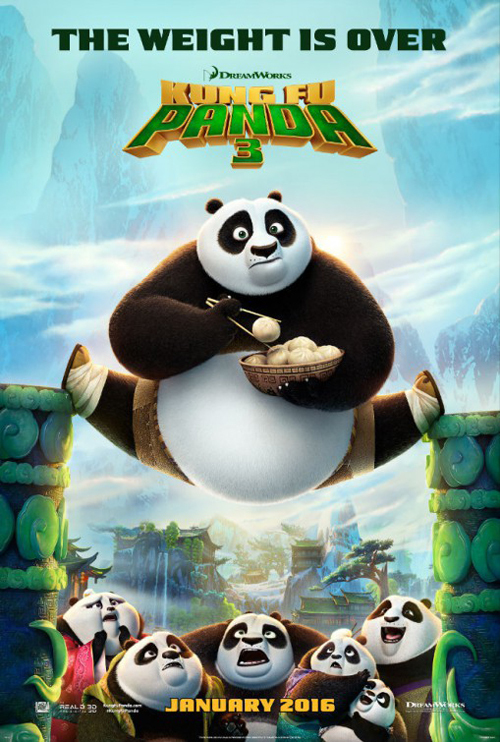 (SPOILERS) The problem with Kung Fu Panda 3 precedes Kung Fu Panda 3, beginning not with Kung Fu Panda 2, although it perpetuates that problem, but Kung Fu Panda prime. It essentially comes done to the title. You’ve heard it, you know the whole shebang. There are no surprises. It’s as resolutely unoriginal as those three words make it sound (or four, if you’re including the numbers in the sequels). And, on top of that, when you have Jack Black cast as the title character, the abject lack of inspiration is simply underlined. So yeah, the first movie was well-made, in that production-line DreamWorks manner, but every plot beat and character moment was wearisomely well-trodden and over-familiar. If you can remember how Kung Fu Panda 2 differentiated itself from its predecessor, well you’re way ahead of me. This one does what most series do when lacking a compass of their own; they look elsewhere. So Po meets his birth father (Bryan Cranston, out to prove he can be cast in any movie under the Sun and no one will recall any of them, except maybe the one with the big monster where he dies in the first reel) and faces his biggest challenge(s) yet, in which he must master his ch’i, learn to teach others and battle evil Kai (JK Simmons – actually pretty good, but then, he’s JK Simmons). Along the way all manner of homilies are broached (”Sometimes we do the wrong things for the right reasons”), platitudes platted, and sage sayings stuffed down our throats (“When will you realise? The more you have, the less you have”; “If you only do what you can you will never be more than you are now”). My interest was piqued only very sporadically; “Even Mr Chicken’s going in there”, since chickens are always good for a laugh; the prospect of Po’s plan being quite clever (it isn’t, not really). The climax in a Super Mario Land version of the spirit world is about as creatively underdeveloped as the rest of the movie, and it comes as little surprise that positive vibes should be required to save our Po, although any left in me by that time were entirely forfeit. Kung Fu Panda 3 isn’t bad, but it reaches a new level of auto-pilot for DreamWorks. Room Two-Fourteen! Gotta be seen! What do you mean you don't like jazz? I know plenty of people who do The Invitation. Woah, he's giving that pig a piggyback. It’s 2016. No one cares about freedom. I know, because I am the Original Angel. You wanted a prophecy? This is your prophecy.